Fonsie Mealy Auctioneers conducted an exciting auction specialising in GAA memorabilia. The sale which was held in The Kilkenny Ormonde Hotel realised almost €245K, according to the records 82% of the 800 lots were sold. 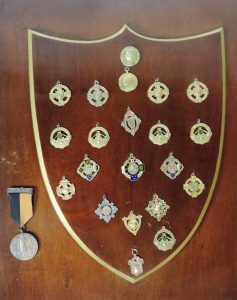 The auction consisted of a collection of rare and historic GAA and sporting memorabilia, as well as other interesting collectors and literary items. The libraries of the late John Bradley (Historian and Archaeologist) and Officer Peter James Rankin, Order of the British Empire (OBE) were included in this specialist auction. John Bradley was said to be an “Inspirational university teacher and foremost archaeologist of Irish towns”. Peter Rankin has been described as a “prominent Belfast solicitor, a connoisseur of antiques, art, music and architecture”. The Book of Kells, published by Facsimile – Verlag, Luzern, is the most precious illuminated manuscript of the early middle ages, now reproduced. The auctioned copy was the first and only complete Fine Art Facsimile Edition, published by Authority of the Board of Trinity College, Dublin. The opportunity to acquire a complete facsimile of one of the world’s greatest art treasures was appreciated on the day with the item selling for €5,000. Respected and missed, Irish author Seamus Heaney’ handwritten manuscript – Celtic Art: An Introduction went under the hammer. This unusual lot also included part of a typed critique of another book, 2 postcards from Seamus Heaney to Kieran Sheedy as well as a Proof Copy of Patrick Piggott’s book, The Life and Music of John Field, 1782 – 1837 – sold for €2000.